The strict definition of the term historically means to orient someone for the purpose of determining their location in relation to a desired destination or objects that may be nearby. But in a broader sense, wayfinding encompasses all of the ways we utilize to orient ourselves in any physical space as we navigate from place to place. Wayfinding functions to inform people of their surroundings in the (unfamiliar) built or natural environment, offering information at strategic points to guide people in the right direction. But perhaps weíre going too fast here. Is this a design process of pure form follows function? Or, is wayfinding experiential? Does it contain a story too? 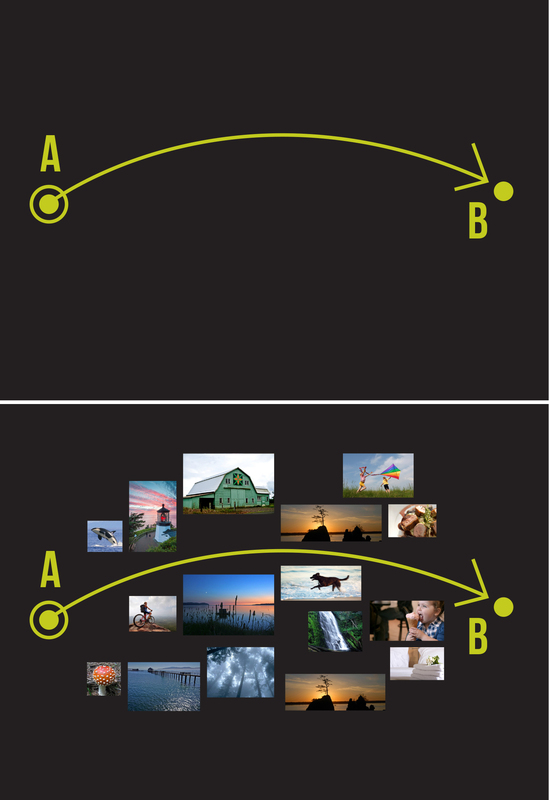 Imagine a point ‘A’ and assume that wayfinding will aid you in getting to point ‘B.’ A good designer will include in this journey the emotional and motivational aspects of the distance being traveled. Inspiration and memory should be a part of the plan. In fiction and comparative mythology, the ëheroís journeyí is the common template of a broad category of tales involving a hero beginning a great adventure, facing a decisive crisis and winning a victory, then coming home transformed. In this scenario, our hero (visitor, student, patient, citizen) needs wayfinding (map, markers and guides). Getting from A to B is just the diagrammatic template for a wayfinding solution. When it succeeds, good wayfinding design incorporates many human needs along the way. So in this broader context, what can wayfinding bring to a project? Wayfinding is the tool that binds: roads, paths, buildings, thought processes, experiences, and more into a matrix. It can assist in getting us between two points in the simplest manner, or it can create a lasting ‘memory-scape.’ Designed effectively, wayfinding is a cornerstone to promotion and a catalyst to expanded interaction; a designed set of elements that help us navigate and provide greater access to discovery.